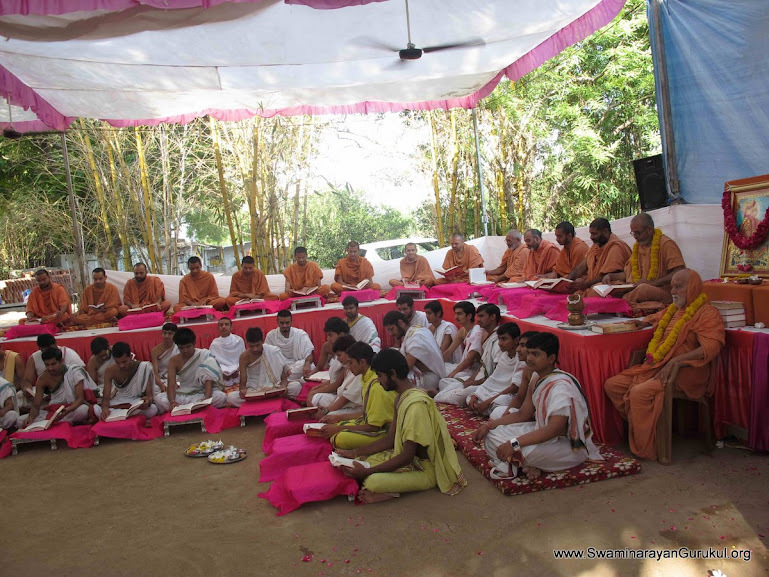 Pujya Purani Swami Shree Bhaktiprakashadasji Swami organized for an Anushthan of Vachanamrut (recitation – reading of Vachanamrut Granth for 108 times) in the pious month of Chaitra, at SGVP afforest area with the trees of Amala (~ Gooseberry) during 27 Apr – 04 May 2016. Saints, Rushikumars of Darshanam Sanskrit Mahavidyalay, students of Shree Swaminarayan Gurukul, Ahmedabad and devotees also participated enthusiastically and performed over 175 path – parayan of Vachanamrut Granth. On the day of Poornahuti, 04 May 2016, Sadguruvarya Shastri Shree Madhavpriyadasji Swami explained the importance of Vachanamrut and inspired for continuing such Anushthan at home to home & personally too, to celebrate the forthcoming 200th Vachanamrut Jayanti celebration. Pujya Purani Shree Balkrishnadasji Swami encouraged all participants of Anushthan and Pujya Purani Swami Shree Bhaktiprakashadasji Swami heartily blessed all.